We're going full speed, Wile E. Coyote on a giant ACME rocket style, headed towards the finish line three weeks away. Looking at our C30 now you're thinking "Wait a sec… it's taken you guys four weeks just to get the car down to a painted shell with roll cage!?!" 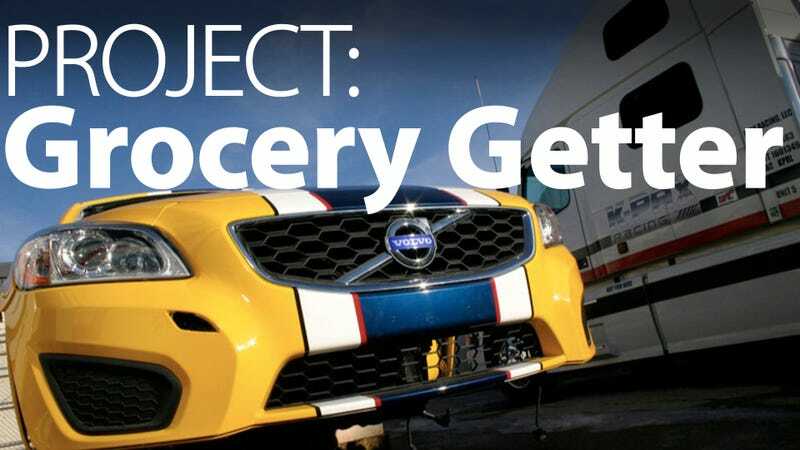 K-PAX Racing's attempting to turn an off-the-line Volvo C30 into a world-beating race car in 60 days. Driver Robb Holland's going to give us weekly project updates. Part five: ABS, ECU, and what a difference a diff makes. —Ed. How the heck are ya'll gonna get the finished racecar out the door in only three weeks more? Well you're right, we're not…we'll be out the door with the car in two weeks. The last week we'll use to go testing to make sure we've got the best car possible to take to the season opener. How are we managing to get things wrapped up so quickly (and I say "we" as if I actually had anything to do with it other than driving the guys nuts with my constantly jumping in the drivers seat to play pretend racecar driver, making "vroom vroom" noises with my invisible steering wheel)? One of the things that we've been doing behind your backs has been planning. Seriously planning. While I've been spouting off to you guys about roll cages, electronics, and stuff, the rest of the team has been analyzing the parts we pulled off of the C30 way back when and working with all of our product partners to come up with a plan to get the best performance out of the car within the boundaries of the World Challenge rules for the class. Key phrase: "within the boundaries of the World Challenge rules for the class." One of the things I skipped over when I started writing this was the Vehicle Technical Specification sheet (VTS). The VTS, which is written by SCCA Pro, tells all the teams, very explicitly, what modifications can be done to their cars in each class. They're so adamant about what can and can't be done to a car that they have a catchall rule that basically says, "If we didn't say you can do it, then you can't do it." Of course, there are plenty of "grey areas" in any rulebook, so there are times where we have to engineer our way around the phrasing of a rule in order to achieve our goal. But there are lines, as a team, K-PAX will not cross. K-PAX Racing has never had a car fail a post race technical inspection and they don't plan on it happing in the future either, especially with our new Technical Director. You think Marlon Brando in The Godfather was tough? He's got nothing on Tech Director TC Kline of BMW racing/ tuning fame. TC has been on all sides of the fence; first as a driver, then team owner, and now Tech Director. He knows all the tricks, arguments and excuses, which means, you ain't gettin' away with schiz-nitz boyeee. The reason I brought up VTS sheets, is that there have been a few questions on why we were doing something a certain way or why we were spending so much time and effort engineering our way around a certain issue as opposed to buying some off the shelf solution. World Challenge in general, and the Touring Car class in particular, is designed to stay as close as practical to the actual stock cars. Touring Car rules are set up so that each of the cars is still very much like the cars you drive on the street. Sure they have cages, big brakes, more power and such but at the end of the day, our car will still be as much Volvo as possible. And that's a very good thing. One of the questions I see a lot is: why don't we just switch over to an aftermarket ECU and get full control of engine tuning and at the same time avoid all of the issues we have with trying to reprogram the stock ECU. The simple answer to that is that in order to make a change of that magnitude we would have to show the Tech guys at SCCA Pro an overriding need to make the switch. TC's first response to a request like that would be something along the lines of: "You chose that car, you figure out how to make it work". If, after struggling with whatever issues you had for several races (i.e. losing a lot), TC would maybe relent and allow you to switch to an aftermarket ECU but he'd also throw 100 lbs of weight on your car as well. Just to eliminate any potential advantage that an aftermarket ECU might bring. The other big thing about switching out the ECU is that we then lose the ability to communicate with the CAN/bus system, which means no power steering and no ABS. I know, as some of you have so politely reminded me, the old school racecar drivers seemed to manage just fine without either one of those luxuries. I totally agree, however there are several other factors to consider. First lets take a look at power steering. In a 300-hp, FWD car with racing slicks, running massive camber and caster, that also happens to weigh 3000 lb, there are huge loads going through the steering wheel. Add to that an hour racing the car at the limit on a 95 degree day and you begin to see why power steering might be kinda important. But even more importantly: just disconnecting the power steering doesn't mean that you just have a rack with no power assist, it means that you have a power steering rack with no power. Duh and/or Hello, you're going to say, but to get a better understanding of the principal, go out to your car and without starting it try to turn the steering wheel. Pretty tough eh? That resistance you feel isn't just the tire scrub on the garage floor, it's also the internal resistance of the rack itself. Without power to the rack you wont just lack power assist, you'll additionally be fighting against the rack as well. Not so easy. Oh and yes, we have to use the stock steering rack. ABS is a whole other Oprah. First the stock ABS in the C30 is really good in the dry but I could manage without it in racing conditions. But in the rain it is almost impossible for a driver (even a pro driver) to equal the control that a good ABS system offers. So if we remove the ABS system we will be at a huge disadvantage to the teams that run with ABS if it rains. In addition, just as with the power steering, getting rid of the ABS system isn't as simple as pulling a plug. Modern ABS systems not only prevent wheel lock under braking, but also electronically control the front-to-rear brake bias. If you disconnect the ABS system you'll be stuck with a braking system with only one master cylinder and no way to proportion the brake bias from front to rear. Drivers without a functioning ABS system would end up with very square looking rear tires by the end of lap one — let alone at the end of the race! The only way to deactivate the ABS system and still have reliable brakes is to change the entire system over to a dual master cylinder system with a proportioning valve that can allow the driver to change the brake bias from front to rear. Doable, but not easy and/ or cheap. So hopefully you guys now have a better understanding of what race teams have to deal with, not only when building a new car, but also as they're developing the car over time. Even series like F1 and Le Mans P1 prototypes have a VTS sheet that constrains what they can do. Our job is even tougher in some ways than those guys as we have to deal with the constraints of the stock street car as well as the series rules. Last week, I promised you guys some go fast parts and I aim to please as the most important piece of our go fast arsenal just arrived (no, not a bigger turbo or our StopTech brake package). No much better than that… we got our diffs in. On a FWD car there is no more important performance upgrade than the diff. It's so important I'll say it again. On a FWD… oh never mind you guys heard me the first time. I'm always amazed at all of the upgrades that guys will do on their cars before they even think about upgrading the diff. Which is really surprising as most FWD street cars come with an open diff. K-PAX Racing has their diffs custom made by a super secret company over in the UK. Seriously, that's how important diffs are to a race team. They're like I-could-tell-you-where-we-get-them-but-I'd-have-to-kill-you important. Like, bolt-on-and-gain-five-seconds-a-lap-on-a-stock-car important. By controlling where and how and how much it locks, the differential not only controls how the power is transferred to the ground under acceleration but also how the car behaves under braking and off/part throttle as well. Basically, everything a car does at a racetrack is influenced by the diff. Because of the inherent design issues that go along with racing a FWD car (drive going to the wheels that also control the steering) a good diff is key to making the car do what you want it to do. Most racecars will use a plate type differential, as opposed to a helical ATB style diff (such as a Quaiffe). A helical style diff never locks 100% which is perfect for the street but, on a FWD racecar we need to get as much grip as possible out of the front tires as they are what limits acceleration out of a corner. Locking the inside front wheel as quickly as possible is key to that, because if it's spinning it obviously isn't putting power down effectively and thus slowing our exit off the corner. With a plate differential we can change the friction material, pre load and ramp angles, to get 100% locking between the front wheels under acceleration, making sure that inside tire is giving its all. Tune in next week as everything starts coming together. We've got brakes, and clutches, and wheels, oh my….